My name is Jennifer and thank you so much for your interest in Happy Bakers Club. 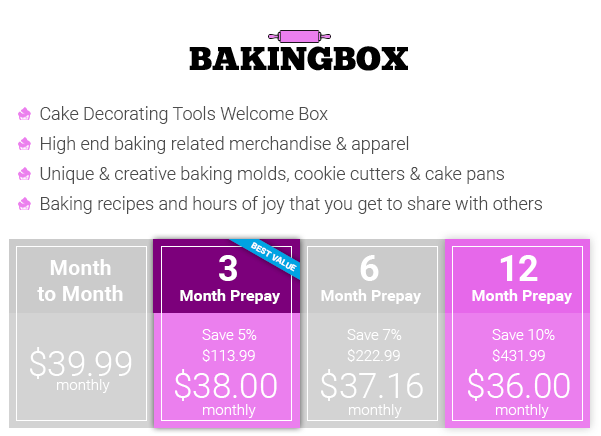 I created this monthly box subscription for people who have a passion for baking as much as I do. Every month, you will receive a brand new box of assorted baking themed goodies to enjoy. As someone who practically grew up in the bakery and loved being a part of everything from sitting under the table and seeing the flour fall like snow as a child to working with the dough when running my own bakery as a young adult to enjoying our baking related online store in my middle ages, I know how hard it can be to find apparel and home decor that fits our passions. That should never be a problem again with Happy Bakers Club! How does Happy Bakers Club work? It's simple. You get a box of cool baking themed products sent to your mail box every month. It's going to be different every month. We'll make sure to send 2-4 or more assorted goodies that any baking enthusiast will love. This could include t-shirts, jewelry, home decor, bakingware, and much more. When do you ship out my box? We ship out on the 5th of every month. Order anytime before the 5th and your box will be shipped out between the 5th and 7th of the month. What if I don't like the baking items I receive? We have an easy no hassle replacement policy. If you don't like the items we send out in your monthly box, then you can send it back to us and we'll send out another random baking item. You can cancel anytime, for any reason with just a few clicks. We hope you'll stay, but we don't make it hard to leave. I would have to say they have the best customer service I have ever seen. I am extremely over the moon with my first box and can't wait for the next one!!! Received my second box but it is a tease to see that the leggigns are listed and next to it (not included)! :( Lol! Loved the tote bag and like that the Russian tips came with the cupler! My box arrived after a stresful week so once again it was like Christmas morning! Next month will be my last box so will have to sign up again! So much fun! Love, love, love my bakers box. Can't wait for next month. The apron and shirts were high quality material and workmanship. I really like it. What a great idea; spreading cheer! The products are good quality and who knew that jewelry was going to be included? Can't wait for the next one. Was so excited to know my box was delivered that I could not wait to get home from work! Love everything in it! I could not be more excited about my box I got this month and ones to come!! Everything has been amazing. I'm able to use each product and love making new recipes with them. I look forward to getting my box every month. I love all the products. It's so much fun to open it.